The Coopered Tot: Port Charlotte PC8 - a chimera of sweet elegant oak and powerful primal peat. 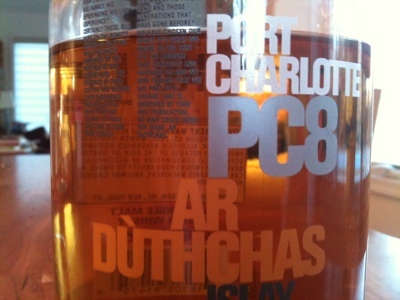 Port Charlotte PC8 - a chimera of sweet elegant oak and powerful primal peat. 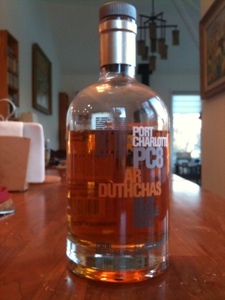 Continuing the reviews of the Port Charlotte series from Bruichladdich. PC8 is aged in second fill ex-bourbon American oak casks, like the PC7 (and unlike the prior two expressions which were sherry and Madeira cask aged respectively). The abv has dropped to 60.5% in the 8 as the angels take their share - still full bore. 8 is yet young and hot. Nose: earthy peat and iodine, but balanced by some vanilla sweetness and heather wildflower in the distance. With time there is some rubber and toffee butterscotch. Entry is sweet and potent. Honeyed cereal grains, and vanilla open. Big spirit heat arrives in the midpalate expansion along with a semi-dry elegant floral highland scotch flavor married to maritime sea air, hemp rope, damp hay, burning coal and some earthy peat at the transition to the finish which is epically long and full of old oiled oak wood, earth, and quiet muted but powerful peat. As the finish unfolds with wave after wave of decaying spirit heat there are bitter notes of the toasted grain variety, lingering cereal sweetness and underlying it all a bedrock foundation of earthy peat which isn't smoky or obtrusive. With extended time there are more elegant toffee scotch flavors up front and more anthracite coal combustion in the finish. It is bittersweet. The peat monster of the earlier expressions is partly tamed and allows the yoke of oak sugars and sweet vanilla notes to half transform it into sweet and vibrant scotch. (the other half remains wedded to the fierce and fiery peat and maritime terroir). Bottom line, PC8 is a centaur - with an elegant and honeyed upper body and the powerful scaly haunches of the Grendel-like peat monster - now clad in thin but elegant vestments. It's a rich dram, almost delicious - but still fierce and hard.